International viewers have experienced a slimmed down BBC World News service as as a result of a 24 hour strike held by the National Union of Journalists (NUJ) triggered by plans to change staffing rotas and hours. 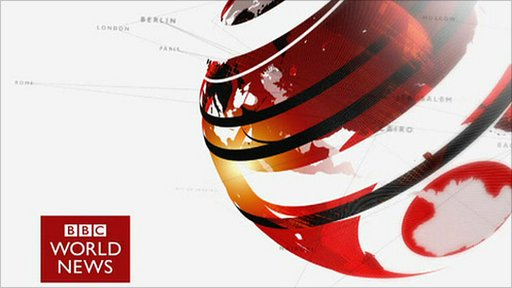 And for UK viewers, many of the simulcasts of BBC World News introduced to the BBC News Channel have been affected, with shows such as Outside Source taken off air by the industrial action. The strike started at 12:00 BST on Thursday 7th and initially resulted in BBC World News simulcasting the first 26 minutes of the BBC News Channel's output every hour, with the exception of 13:00 and 18:00 when BBC News Channel was simulcasting the main BBC One bulletins, leaving BBC World News showing recorded news. During the evening, regular news bulletins on the channel, as well as Outside Source were replaced by bulletins hosted from the BBC's Washington D.C. studios, ahead of the usual World News America programme. Newsday, which from 00:00 BST is simulcast on the News Channel, was presented solely from Singapore. Basic news bulletins appeared on the hour for the remainder of the night, but the normal simulcast ended 15 minutes earlier than normal, with international viewers seeing a recorded Sport Today, while UK viewers saw tech magazine Click leaving an eight minute gap filled with a repeat of the 21:55 BST long-range weather forecast and several minutes of trailers and promotions. Having maintained a basic service during the overnight simulcast, morning programmes were among the worst affected, with no news programmes scheduled on BBC World News for four hours, although business and sports programmes continued as normal. Earlier this week, the NUJ claimed that the proposed rota and working hour changes were paving the way to completely merge the BBC News Channel and BBC World News. The UK-centric news agenda dominated by the country's political crisis offset by the escalating race relations crisis dominating World News has shown the difficulties juggling two different agendas to two different audiences during the strike period, with barely any World News covered during the initial News Channel simulcasts.